The SDCVA provides wine industry education to its members concerning wine growing and production, and to the general public regarding wine appreciation and current state of the wine industry in San Diego County. 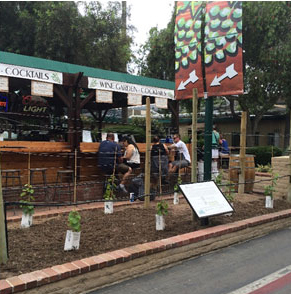 Presentations to the general public include a demonstration vineyard project, sponsored by and maintained by SDCVA, located in the Garden Show area of the San Diego County Fairgrounds; a display and rolling slideshow at many wine tasting events across the county illustrating the annual cycle of grape growth and wine making; and wine tasting and wine evaluation tutorials. The demonstration vineyard at the fairgrounds illustrates three vineyard styles with three grape varietals planted. In 2015, the SDCVA fair exhibit received the Garden Show Award of Merit, the Manager’s Award, and the Bill Teague Award. As a perpetual exhibit, visitors can see year to year how the sample vineyards develop from the initial plantings, through trellis training, and eventually to fruit producing configurations. Please visit the SDCVA exhibit whenever you are at the San Diego County Fair. Technical winemaking and vineyard seminars are scheduled throughout the year. While primarily designed for our commercial winemakers and grape growers, these seminars are often open to non-members and to the general public for a minimal charge. Visit our events calendar for class schedules.